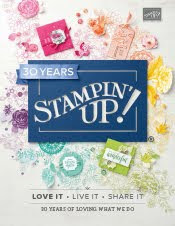 Just Julie B's Stampin' Space: Banner for a Big Day! Banner for a Big Day! I've been working on this banner for my daughter's 21st birthday! Wow, hard to believe that she will be 21 - Time flies!! We're planning a little family get-away this weekend to celebrate. So I decided to put together a few favors and things. Our Perfect Pennants Die makes it pretty easy to make a cool banner. I chose Wisteria Wonder, Baja Breeze and Island Indigo to create with. And then I just had some fun layering lots of 'stuff'!! This little Pennant with the 21st is my favorite part! I put a little ribbon frosting around a Wide Oval punch to set off the 21st. And I added a few Rhinestone blings, and my new favorite, Silver Shimmer paper! I'll show you more of the stuff I'm doing later - you never know who might be looking and I want to leave a few fun surprises! That's one lucky 21 year-old. Your banner is fabulous! The banner looks awesome Julie!!! Happy 21st birthday Jessie, I hope your family has awonderful time celebrating! Saved One of the Cutest for 'Almost' Last! Gettin' in the Halloween Mood! A Creative CASE and a Reminder! My Big Debut and a Giveaway! Mocha Morning Makes it Masculine! Rollin' Up with a Cool Box!